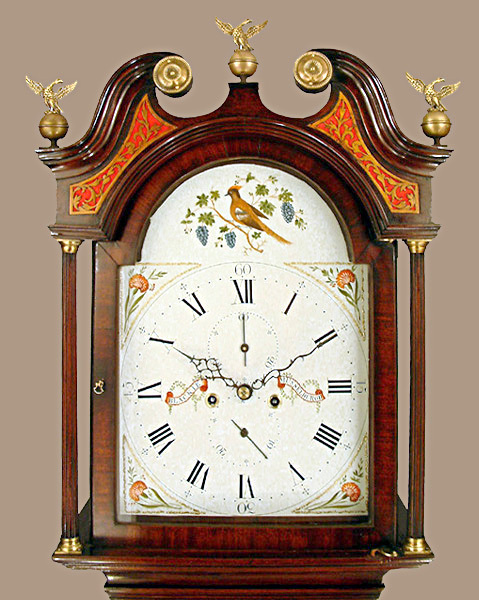 George Blackie of Musselburgh Longcase Mahogany 1805/10 - Height 89in. This Longcase Mahogany's Maker - Geo ( George ) Blackie of Musselburgh recorded working 1796. Typical late 18/early 19C long door East coast Scottish case of richly coloured and patinated mahogany with swan neck pediment having pierced infills under, the trunk with reeded quarter columns. Shallow bracket feet. 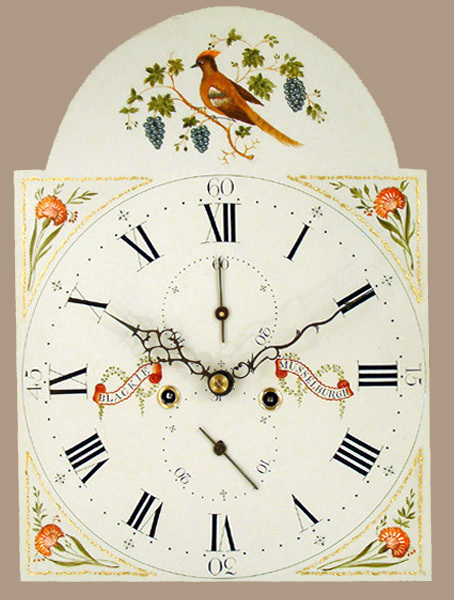 13" breakarch painted dial with subsidiary seconds and date dials, exotic bird painted to arch and flower painted corner spandrels. Blued cut steel hands. Four pillar 8 day movement with hourly ( rack ) striking on a single bell. Geo ( George ) Blackie of Musselburgh recorded working 1796. 89" ( 226 cms. ) or 87.5" (222 cms. ) ex. finials.